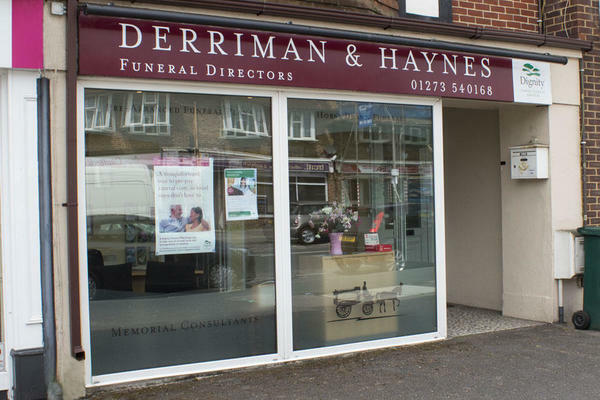 With our commitment, since the 1980s, to helping the families of Brighton, Derriman & Haynes Funeral Directors in Patcham is here for you. You can depend on us to provide professional funeral care and to arrange the dignified send off of your loved one. We believe in setting the standard as far as offering support and funeral services go. This means you will receive nothing but kindness and be treated with absolute integrity at all times. It also means you can be sure the funeral will be tailored to the way you want it and will proceed smoothly and as intended. Once your loved one is entrusted into our care, the understanding team at our Patcham funeral directors will look after everything. Through as little or as much involvement from yourself as you are comfortable with, they will arrange a beautiful service allowing you to pay your respects in a meaningful way. Our funeral home is located on the Ladies Mile Road, in the Patcham area of Brighton & Hove, and is easily accessible to the whole of the local community, along with the surrounding areas such as Coldean, Withdean and Woodingdean. We are available to talk 24 hours of the day, so if you have experienced the loss of a loved one and wish to arrange a special funeral, give us a call. Call us today on 01273 540168 to talk through your personal requirements. At Derriman & Haynes Funeral Directors, we understand how special life is with those that you love. For us, every funeral is unique and personal. We have a service to fulfil every wish, with every detail carried out with the same uncompromising quality of care. From a traditional service, to a colourful woodland burial, your options are limitless with our Full Service Funeral. If you have a little more flexibility when it comes to arrangements, then we can provide a Simple Funeral for a lower cost. There is a parking space in front of our garage doors on Winfield Avenue, or you can park on Ladies Mile Road. We are on Ladies Mile Road, close to the crossroads with Winfield Avenue, not far from the grounds of Patcham High School. Our staff are available 24 hours a day on 01273 540168 if you require our services outside of these hours.